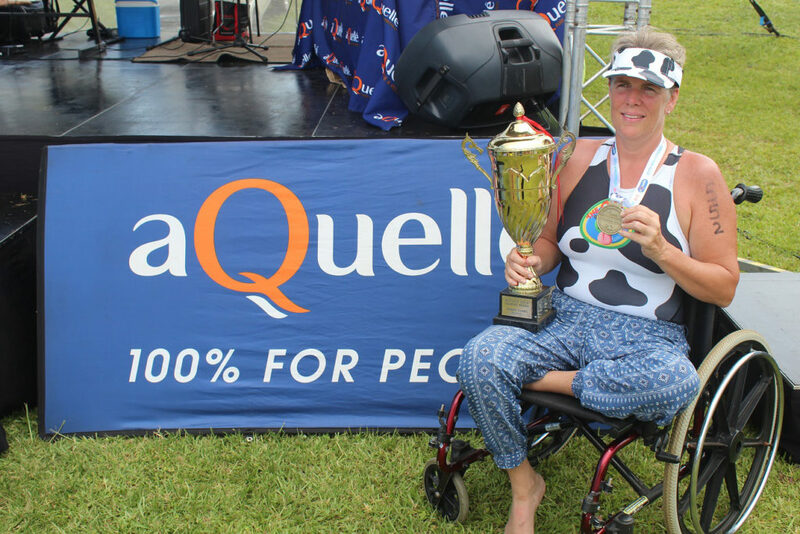 After her first year of representing The Cows at the 2018 aQuelle Midmar Mile, Tracy Mckay, who won the ladies race in the physically disabled category, is eager to raise even more money for CHOC at the famous open water swim this weekend. Mckay has swum the Midmar Mile a total of 12 times with three of them happening as an able bodied person before she picked up a degenerative condition post cervical cancer treatment that led to her losing use of her legs. She completed the 2010 event and has done every race since then and managed to win the ladies physically disabled race last year and finish fifth overall in the physically disabled category. Without the use of her legs swimming has become a sanctuary for the Durban resident and looks forward to taking on the iconic event every year. “Swimming has become a massive part of my life,” Mckay said. “Especially open water swimming because it is my freedom and I have that feeling of weightlessness. Once again CHOC will be the central focus for Mckay at this year’s race as she tries to raise as much money as possible for children suffering from cancer. “Last year I reached my target of raising R4000 so this year I upped the number to R5000 and so far I have R5000 in online donations! “I have also got money from raffle ticket sales at the Comrades Marathon and then I am going to raffle a hand knitted cow at the Midmar Mile so if you see me, come and buy a ticket!” she added passionately. Mckay has managed to continue to do as much as she possibly can despite her disability and while she will be chasing another category title at the Midmar Mile she says cannot get enough of the event and how much camaraderie it brings. “There are always so many people there to cheer you on and it is a great gathering of people and for The Cows it’s an incredibly showing of unity and charity. “I love seeing all of the swimmers in the cow-print costumes and the happiness that an event like the Midmar Mile brings,” she added. Swimming is not the only sport that Mckay takes part in and despite her disability she continues to defy the boundaries of it. “I am a swimmer, a rower and I take part in adaptive surfing. “I love the water and I find that when other people are treading water, I just float!” she laughed.